The president’s advisers and lawyers demand apologies from Trump’s critics and call on Adam Schiff to resign. President Donald Trump’s top aides went on the attack Monday in the wake of special counsel Robert Mueller’s finding that there was no collusion between Trump’s campaign and the Kremlin. Allies including senior counselor Kellyanne Conway, press secretary Sarah Huckabee Sanders and Trump’s personal lawyers Jay Sekulow and Rudy Giuliani appeared on nearly every morning news show to mark one of the biggest victories of Trump’s presidency thus far: Attorney General William Barr’s letter to Congress Sunday that largely cleared him of wrongdoing. Their declaration that the president has been completely exonerated by Barr’s four-page letter to the leaders of the House and Senate Judiciary committees is at odds with the few words Barr ripped directly from Mueller’s findings. But that didn’t stop the president’s aides from taking shots at Democrats and the media during their victory lap. Conway, a senior counselor to Trump and his final campaign manager in 2016, asserted in an interview on Fox News’ “Fox & Friends” that the president’s accusers “owe America an apology” for their “haranguing and harassing” of Trump and his inner circle over the Russia investigation. Conway and fellow Republicans like House Minority Leader Kevin McCarthy have settled on House Intelligence Chairman Adam Schiff as a Democratic fall guy for his impassioned defenses of the Russia probe, both calling for his head Monday in light of Mueller’s findings. On “Fox & Friends,” Conway quoted Schiff and Democratic National Committee Chairman Tom Perez’s claims that there was bountiful evidence that Trump conspired to work with Russians and demanding Schiff’s resignation. Sign up for our must-read newsletter on what’s driving the afternoon in Washington. Barr in his letter said that the special counsel’s nearly two-year investigation into the matter “did not find that the Trump Campaign, or anyone associated with it, conspired or coordinated with the Russian Government in these efforts, despite multiple offers from Russian-affiliated individuals to assist” the campaign. While Mueller found no collusion between Trump’s campaign and Russia’s efforts to influence the election, Barr told lawmakers the investigation was less conclusive when it came to the question of whether Trump sought to interfere in the probe. Mueller left the question up to DOJ, where Barr and Deputy Attorney General Rod Rosenstein concluded there wasn’t enough evidence to prove obstruction. Still, Barr said, “the Special Counsel states that ‘while this report does not conclude that the President committed a crime, it also does not exonerate him,’” a portion of the letter Democrats have seized on. Sanders took issue with the idea that Barr’s letter didn’t completely clear the president of wrongdoing, arguing in an interview on NBC’s “The Today Show” that Barr did so by declining to pursue the obstruction issue after it was left up to him by Mueller. “It’s very hard to obstruct something when there was no crime,” she added. Trump’s aides split on Monday when asked of their opinion on the special counsel. The president has repeatedly disparaged Mueller since he took over the Russia investigation, and his allies were asked multiple times whether he was owed an apology for Trump’s harsh treatment. Sanders echoed Conway’s demands for an apology, appearing affronted when asked whether it was Trump who should apologize for repeatedly dressing down Mueller in public and on social media. “Are you kidding? The president’s rhetoric matches their, literally, the media and Democrats have called the president an agent of a foreign government, that is an accusation equal to treason, which is punishable by death in this country,” she told NBC’s Savannah Guthrie emphatically. Though Sekulow wouldn’t go into detail on what he called the investigation’s “hiccups,” he argued that “it’s very hard to complain” with how the investigation turned out and praised the special counsel for conducting himself professionally. Trump for his part also said Monday that Mueller conducted himself honorably, a departure from his rhetoric about the special counsel over the last two years when asked by reporters. “Yes he did,” the president replied after giving a prepared statement with Israeli Prime Minister Benjamin Netanyahu. Trump reiterated his constant allegations of “presidential harassment” though not in those words. 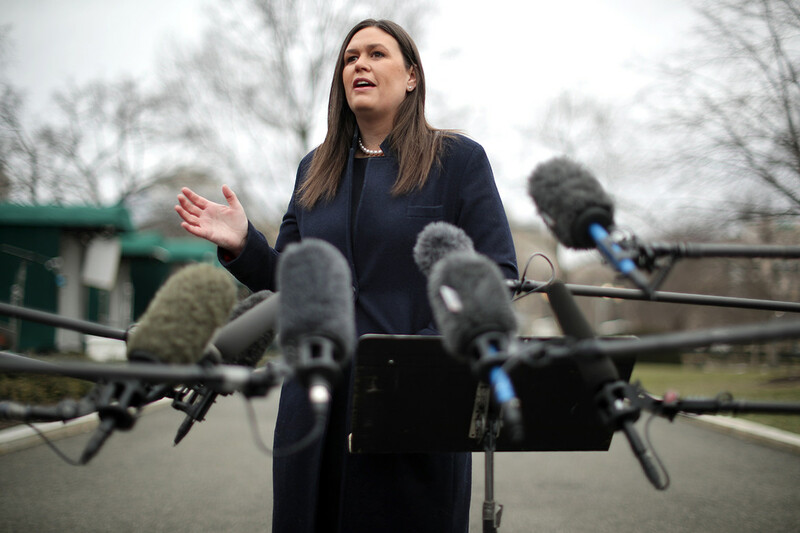 Sanders and Giuliani also expressed surprise at a lack of contriteness coming from the president’s critics, rebuking the “breathless” coverage of the Russia investigation over the last two years. Sanders went a step further, accusing those who frequently railed against Trump on TV of attempting to subvert democracy. Conway also said Americans should celebrate the findings — and she took another shot at the FBI for opening probes into Trump in the first place. Sen. Lindsey Graham, one of Trump’s top allies on Capitol Hill and chairman of the Senate Judiciary Committee, pledged Monday to open an investigation into what was going on behind the scenes in the Justice Department leading up to the 2016 election. The president on Monday declined to say whether he still thought the Russia investigation was a witch hunt but indicated that some sort of a reckoning was coming for those who drew out the Russia probe. While Trump reiterated his calls for making Mueller’s entire report public, he and his aides walked back those comments a bit Monday, appearing largely deferential to Barr. Sanders punted the decision on any public release to DOJ and the White House counsel’s office while arguing that Trump should change how sitting presidents are investigated. Sekulow also told “Morning Joe” that Trump would defer to the attorney general on the report’s full release, and though he suggested Barr will move to do so, he noted that Barr will likely seek to redact sensitive grand jury or national security information. “There’s a process and steps that have to go forward, but I suspect he’ll make as much of it public as possible, and it will be sooner rather than later,” he said.